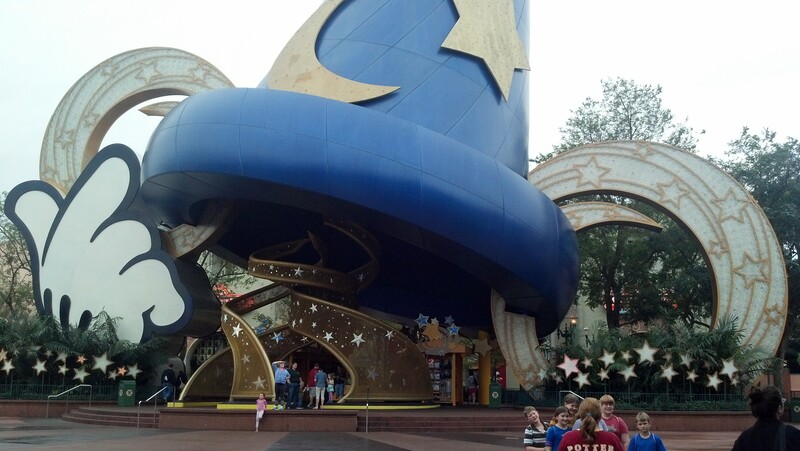 Any trip to Walt Disney World includes trips to the theme parks. Right? I’m sure that to some of you it is probably surprising that it took us until day 3, the second full day in Orlando, to hit up a theme park. This was partly due to the fact that I’ve never taken a race-cation before. 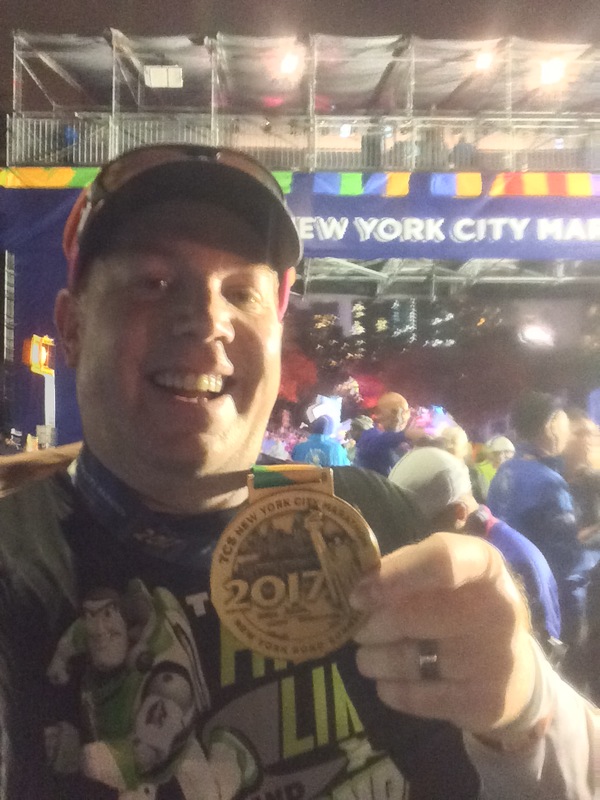 Also, with the marathon still coming up on Sunday, I wanted to make sure that I finished in the upright position and didn’t know how much theme park time would hurt me on running the marathon. In planning this trip, Brooke and I decided that 3 days with theme parks would be enough. 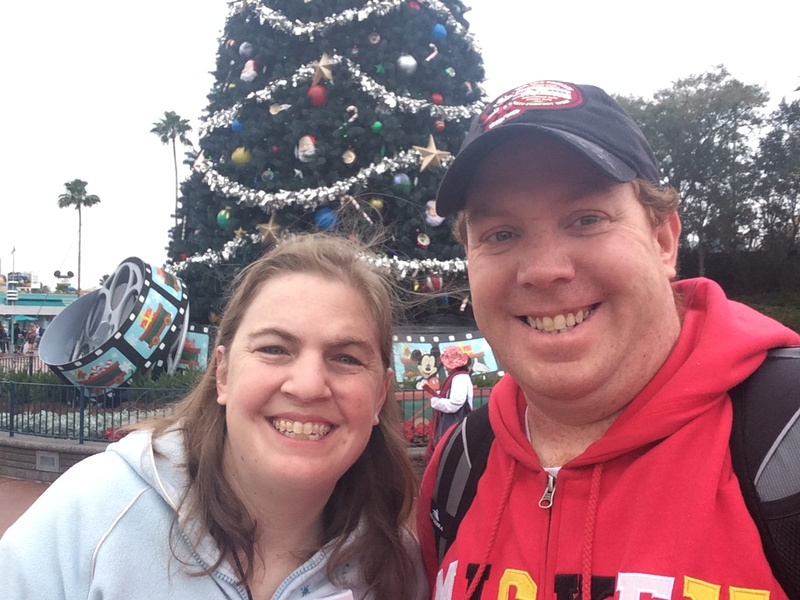 We’re Disneyland regulars who live in the suburbs of Los Angeles. So, for us, theme park visits happen several times a year. 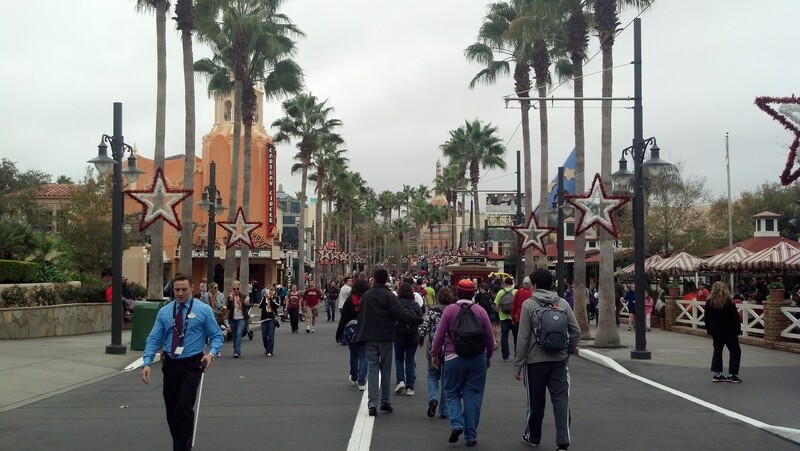 However, we’re used to going to a theme park like Disneyland on a Saturday and then coming back months later. As I’ve read trip reports (both of those who ran in runDisney races and others just on a vacation to Walt Disney World), it’s clear that those that are Walt Disney World regulars are used to doing theme parks differently. We just had to go with what works best for us. 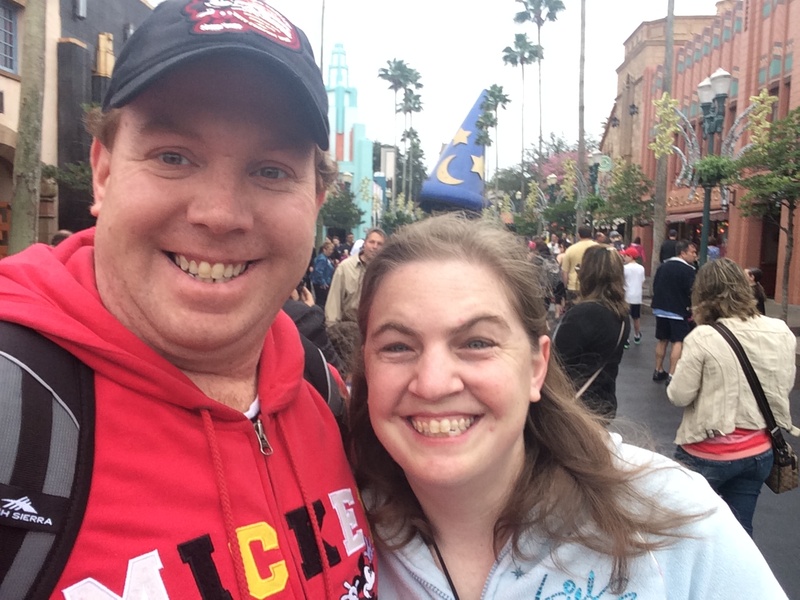 So, on the day of the Walt Disney World 5K race (the start of the Dopey Challenge), Brooke and I went to both Disney’s Hollywood Studios and EPCOT. 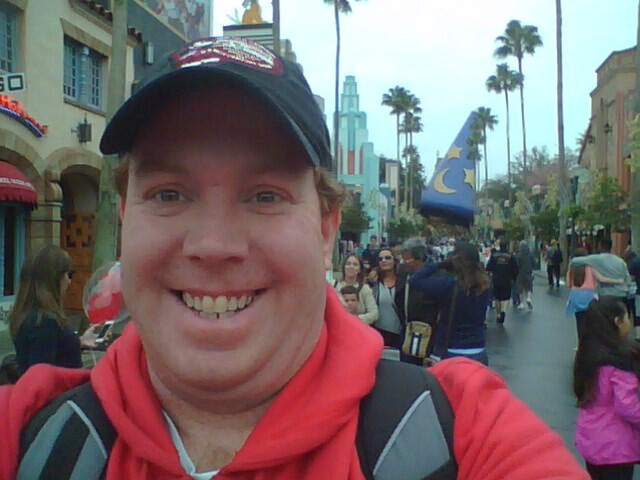 This post will just cover Disney’s Hollywood Studios because that’s where we started. 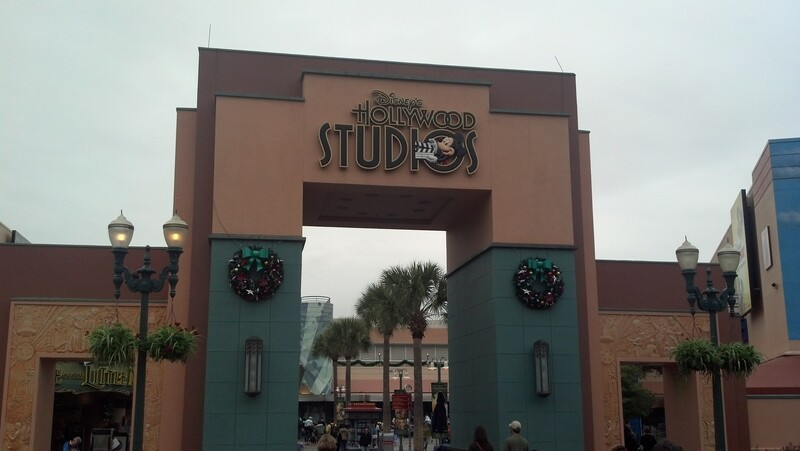 We were both really surprised to find that Disney’s Hollywood Studios (DHS) was still all decked up for the holidays. How fun! 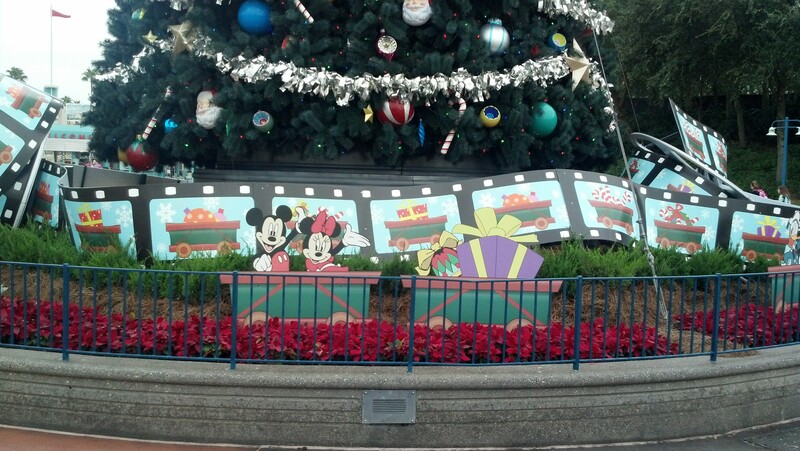 So, for the first time, I got to see a Christmas tree at a Disney theme park not in California. 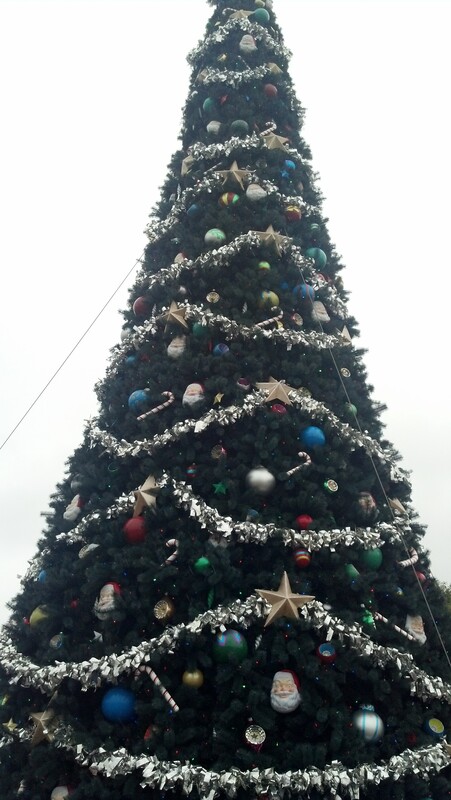 Like the Christmas trees in Disneyland and Disney’s California Adventure parks, this tree was crazy tall! Yes, I know. 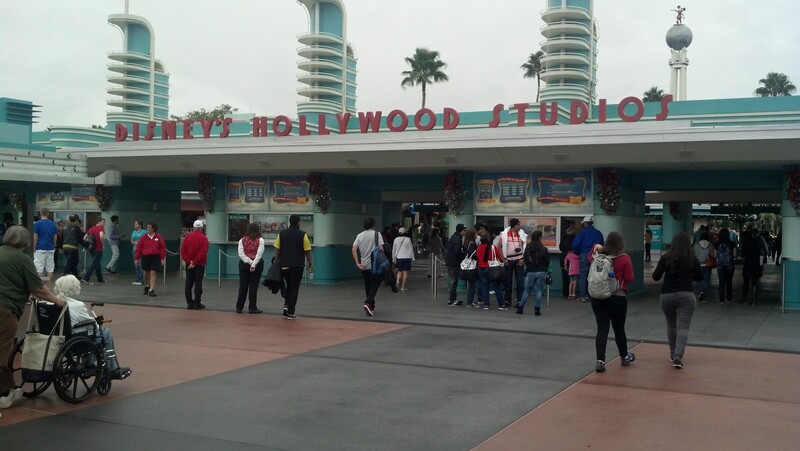 Disney’s Hollywood Studios had their entrance looking like that before Disney’s California Adventure. I just find it interesting how much they look alike. One of the differences, other than the names of the theme parks, is that tickets are sold beneath the “Disney’s Hollywood Studios” sign. Other similarities? 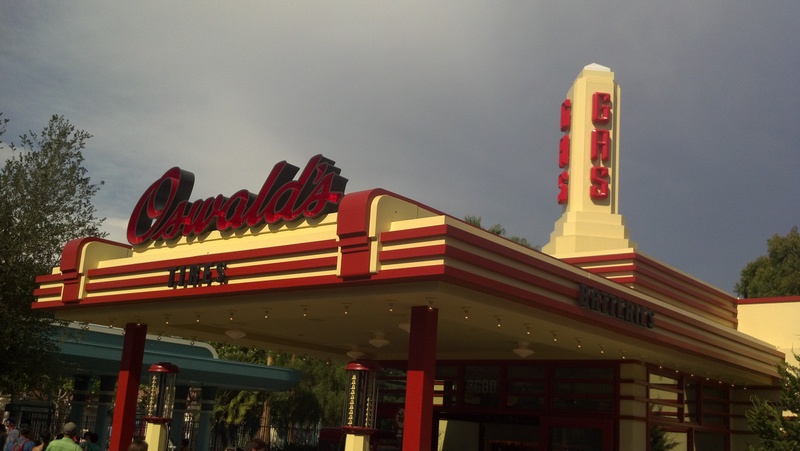 Oswalds at Disney’s California Adventure. Both locations are similarly places towards the front of the park. But, I digress. On an overcast day, we made it into the park! Gotta love the hat! This is one of my favorite pictures from the day. I was able to line up Brooke so it appeared that she was wearing the hat. Yes, we were having some fun right from the beginning. That is one big hat! Anyways, I used the My Fast Pass+ to set up passes for three attractions…The Voyage of the Little Mermaid show, The Indiana Jones stunt show, and Toy Story Midway Mania…before the trip. 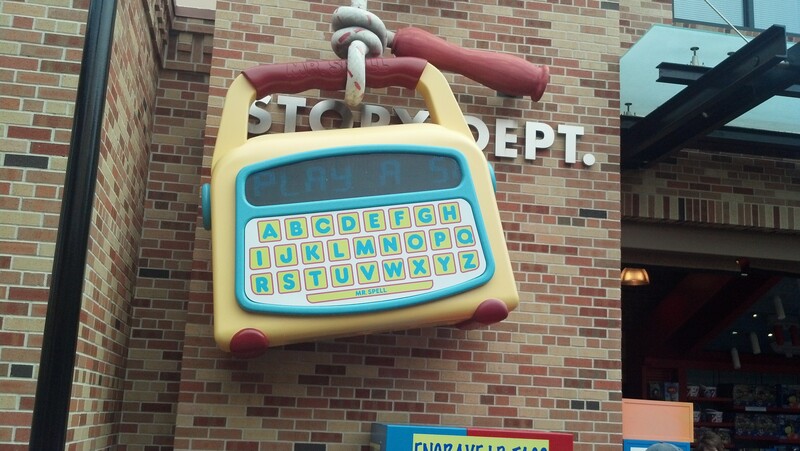 I actually only wanted to set up a fast pass for Toy Story Midway Mania. However, the web site sort of forces 3 attractions on you. For me, this is the downside of My Fast Pass+. You only get 3 fast passes to use in any given day. The way the system is set up, you only get to select from one theme park. So, if you’re planning on park hopping, like Brooke and I were planning, you’ve just got to choose which theme park you want to use the fast passes for and deal with the regular lines at the other park(s). Also, it won’t let you select only one attraction to use the fast pass for. 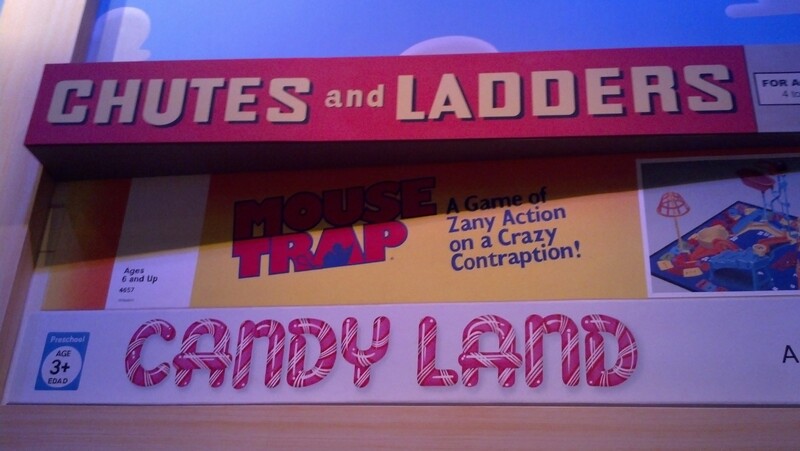 When I initially selected Toy Story Midway Mania, it added two other options to make three. Then, you are given 4 options of when to schedule your fast passes. Since I didn’t like any of the options for my Toy Story Midway Mania fast pass, I added the Voyage of the Little Mermaid show. That still didn’t help. So, I added the Indiana Jones Stunt Show and was finally able to get options that I liked. By the way, we didn’t end up going to the Indiana Jones stunt show. The fast pass time was scheduled during our lunch reservation. So, I was fine with skipping that one. 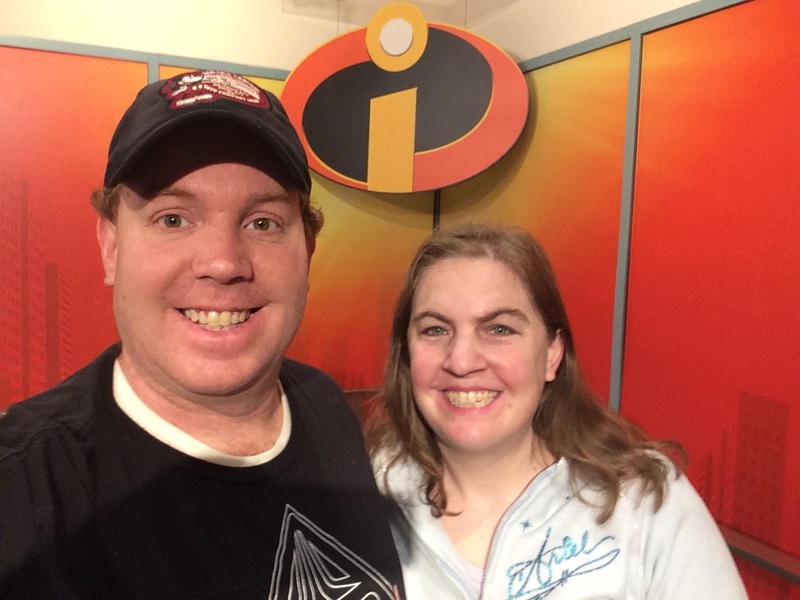 Since we were early for our first fast pass time, we headed to the Disney’s Animation building. When Brooke and I were on our honeymoon, we skipped this place. 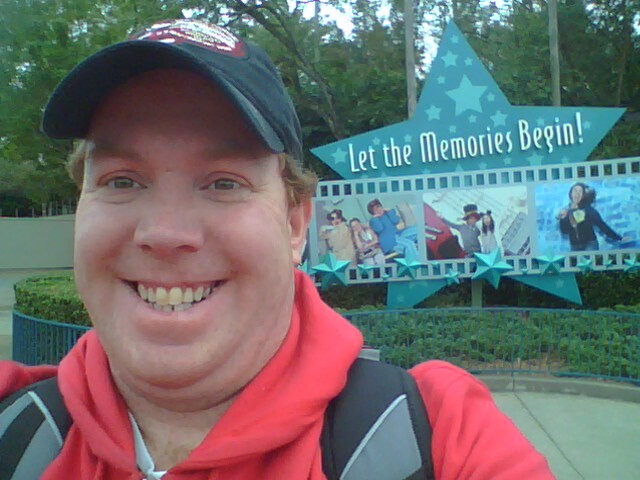 My only other visit to DHS, I got to check it out. 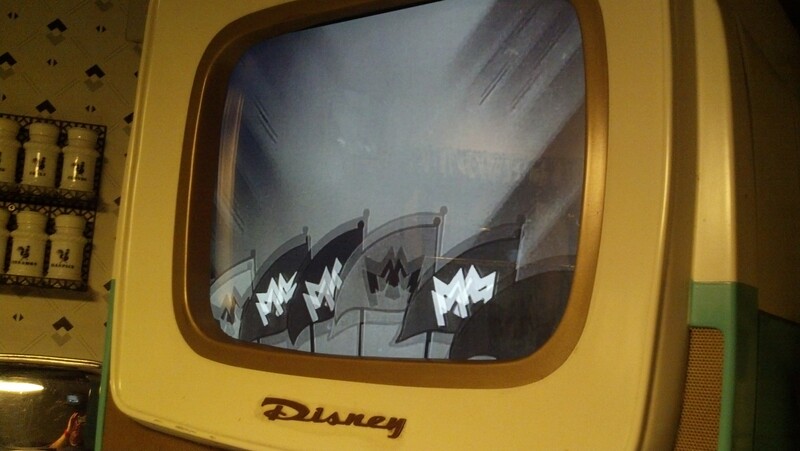 Back then, they had a tour and you could see animators at work. Things were much different now. 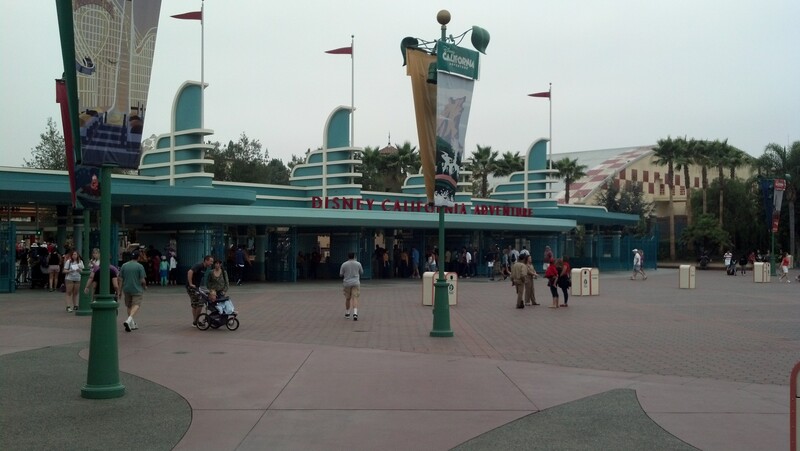 This building operates similar to the Art of Animation building at Disney’s California Adventure. Although, they have added places for character photo ops. I’m sure that there are characters from the Incredibles here at some point. However, Brooke and I took advantage of their absence. Yep. Mr. and Mrs. Incredible have arrived! 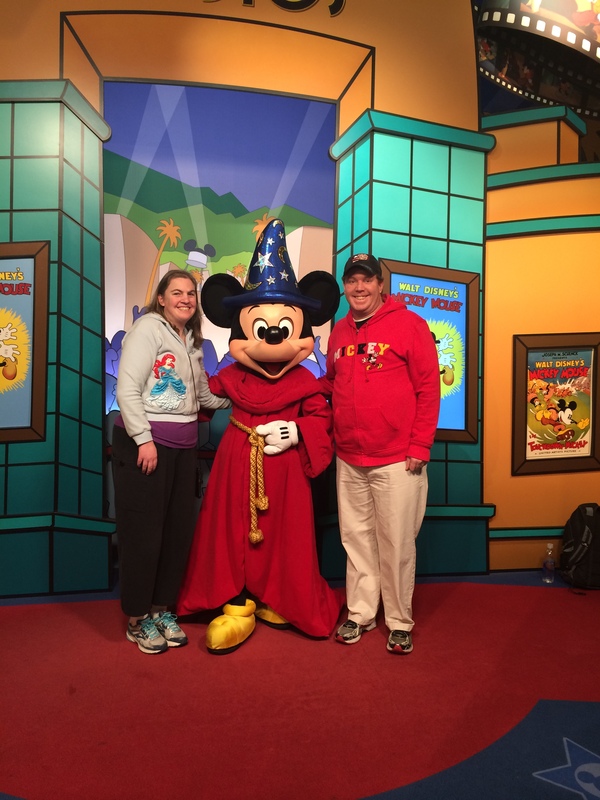 Since the line was short and I was running in Mickey Mouse’s race, we had to get our picture with the big cheese himself! I loved Wreck it Ralph! 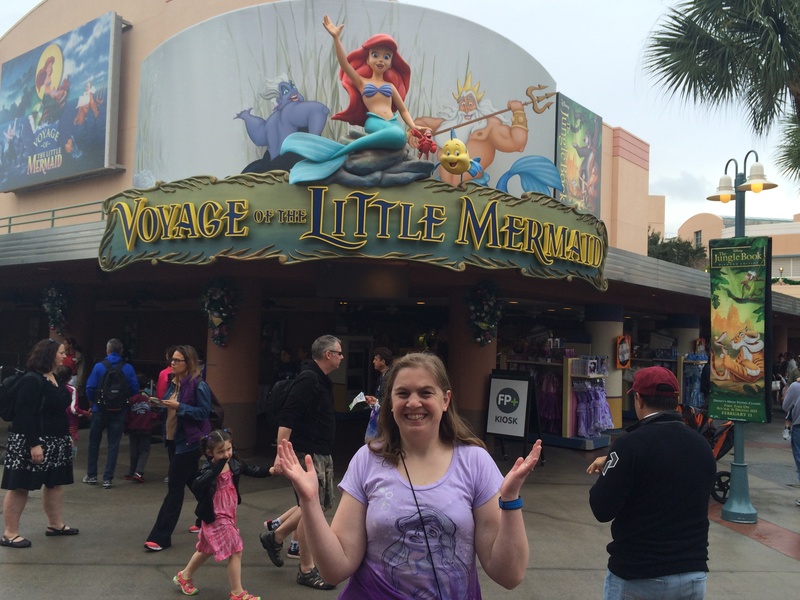 It was time to use our first fast pass…Voyage of the Little Mermaid. Brooke and I each had a short list of attractions we wanted to take in at the theme parks that day. Brooke is a huge Ariel fan. So, even though this is a show geared towards the little ones, it was on her list. Also, she liked the show when we saw it on our honeymoon. Now, you probably don’t need a fast pass to this show. 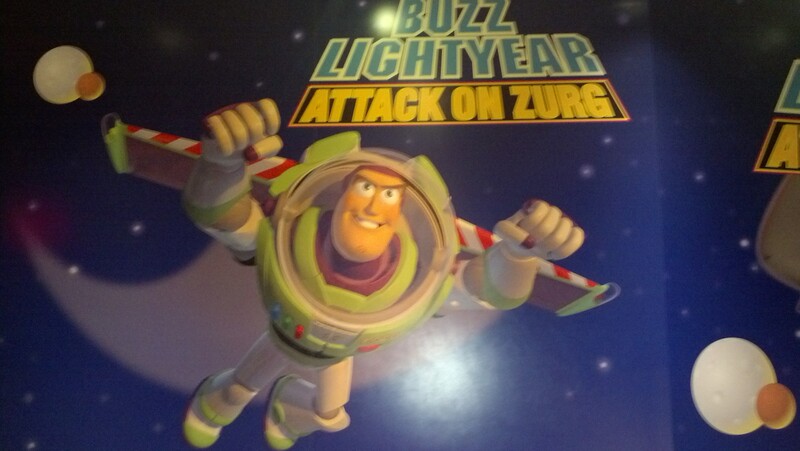 However, like I said, including this show helped me get a favorable time for Toy Story Midway Mania. Fast passes with your Magic Band was a fun new experience for us. After all, at Disneyland and Disney’s California Adventure, we only have the paper tickets. So, if you haven’t used them, this is how it works. You go to the Fast Pass entrance. You line up your magic band with a stand that has Mickey Ears on it. If you’re there during your given fast pass window, it will light up and turn green! Then, you go to the end of the fast pass line and have to do it once again. 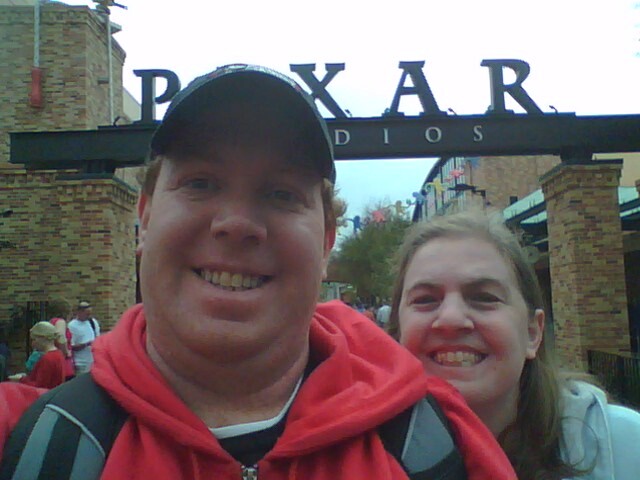 After Voyage of the Little Mermaid, we has some time before our fast passes for Toy Story Midway Mania. So, we went to get inspired. 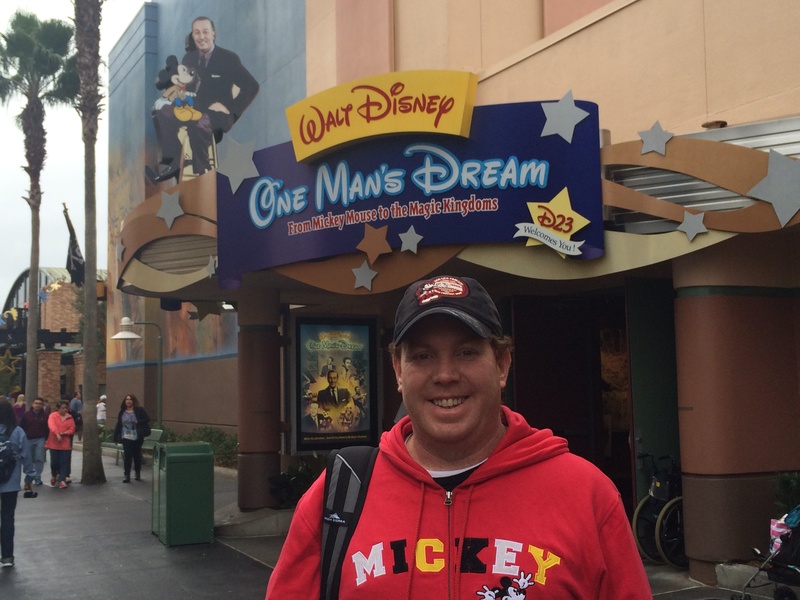 One Man’s Dream is another attraction we skipped on our honeymoon. 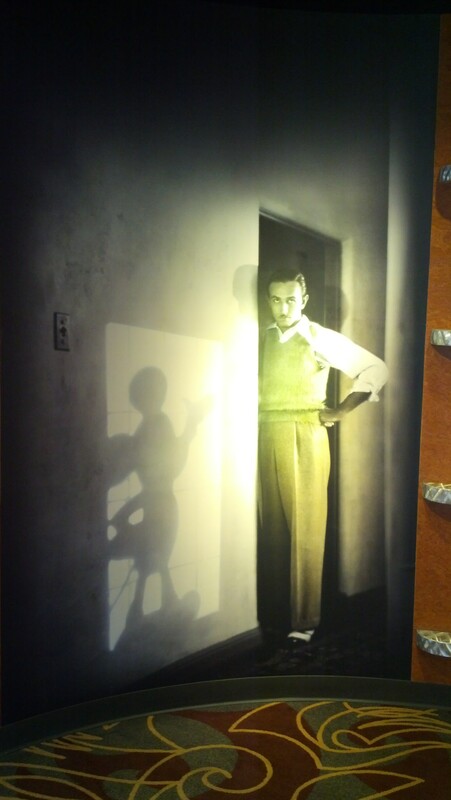 They used to show this film at Disney’s California Adventure in the Art of Animation building. Then, Turtle Talk with Crush replaced it. One of the things I love about Walt Disney World is that many attractions that had to be closed at the Disneyland Resort to make way for new attractions are still around! 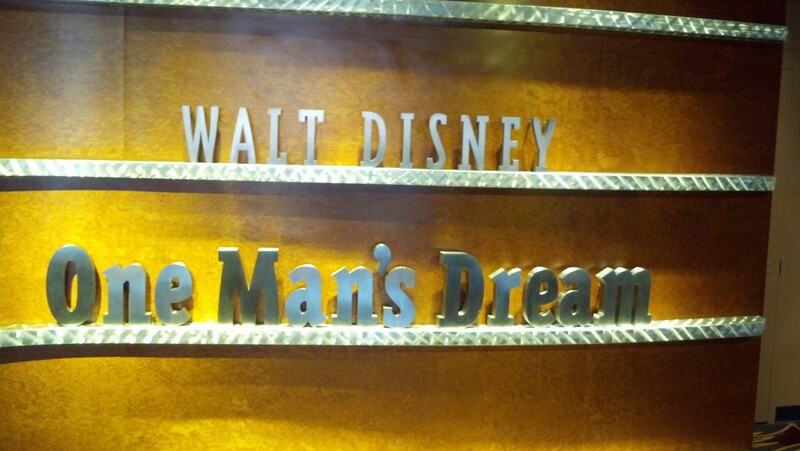 I had thought that this would just be a theatre showing the film One Man’s Dream. I was wrong. 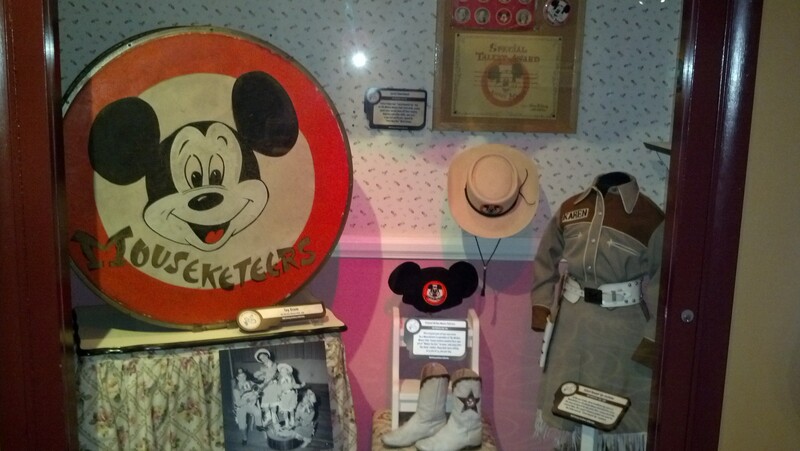 There is a whole exhibition area that brought back memories of my trip to the Walt Disney Family Museum. 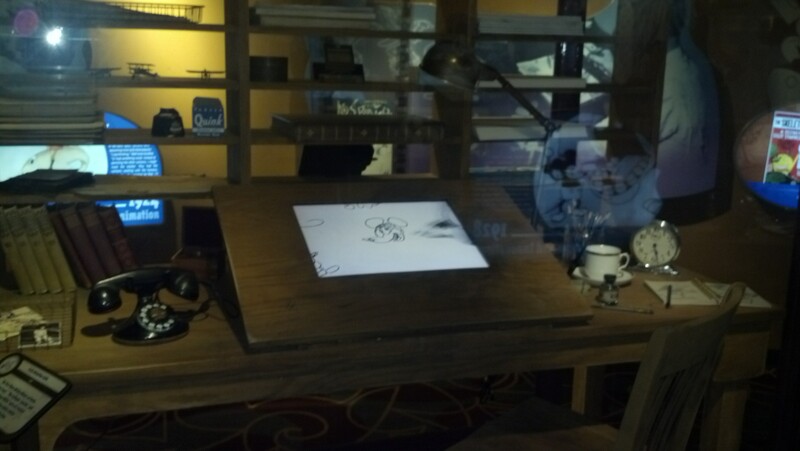 I loved seeing things like the replica of an animator’s desk from back in the day! Due to time constraints, we had to book it to make the showing of the main attraction…the film. While I didn’t get to capture the film on video, others have. If you want to be inspired by this film, check out the following You Tube videos. 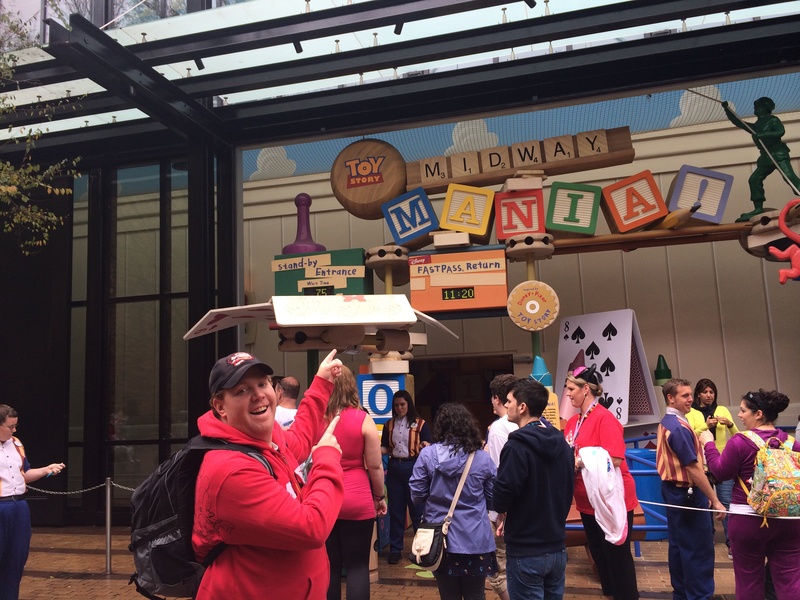 I loved the whole Pixar Studios area that surrounds Toy Story Midway Mania! 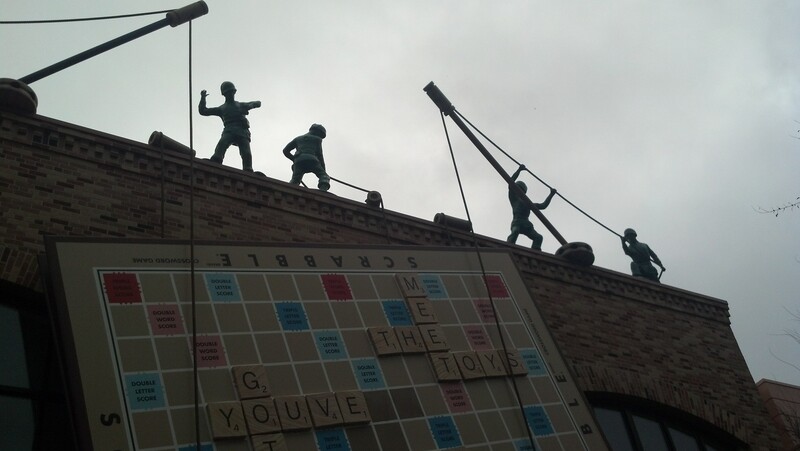 The green army guys and the giant Scrabble board. It was all fun to take in. 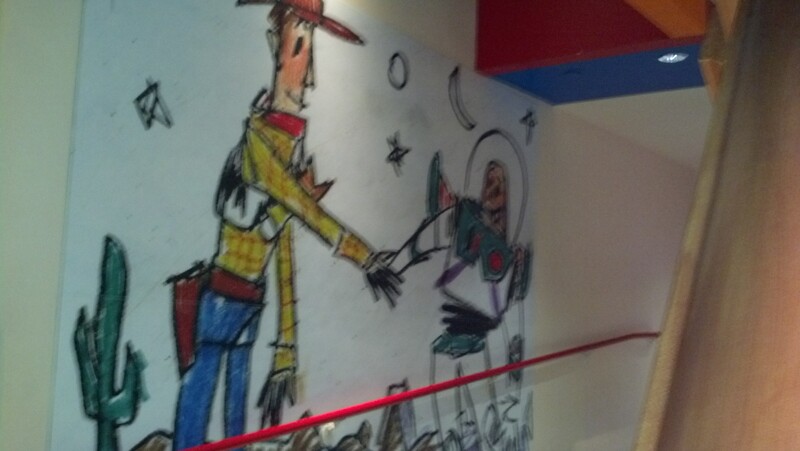 It was like being in Toy Story heaven. 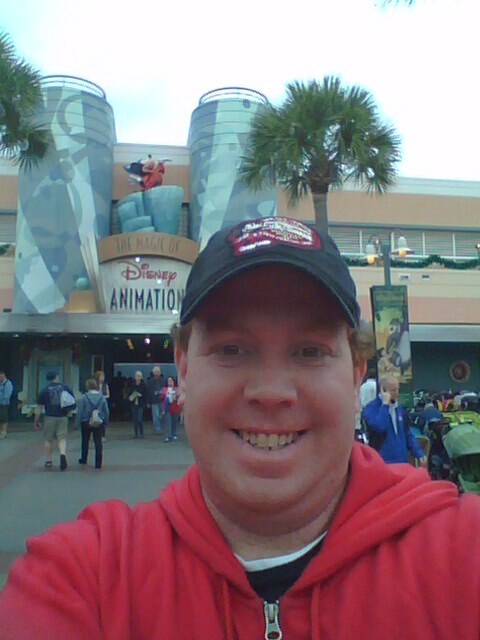 As much fun as it was to take in the atmosphere, I was here to ride the attraction. We had to get going! As you will find if you visit the Disney theme parks in Florida and California, the queue lines in Florida are much more fun than the California counterparts. 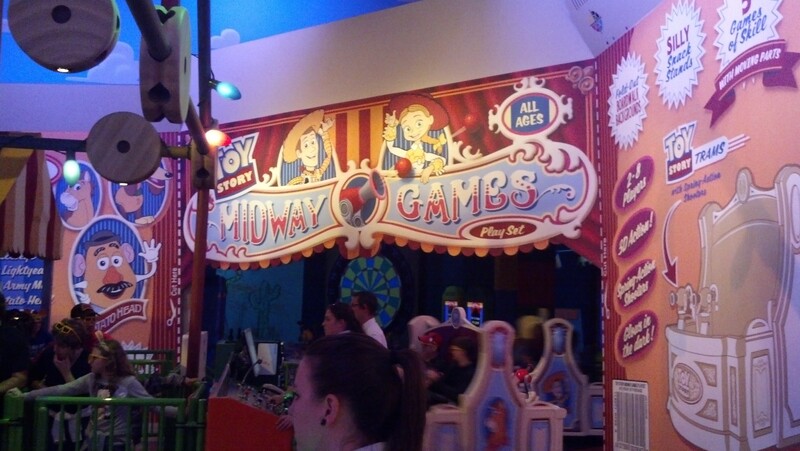 Toy Story Midway Mania is no different. 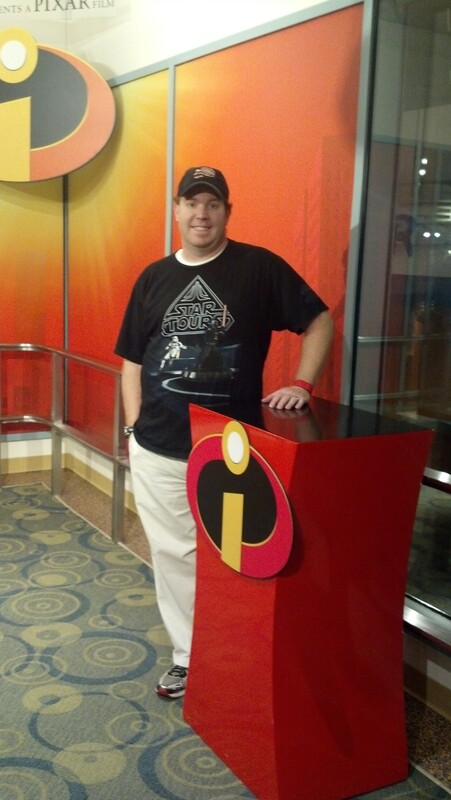 I work for Disney in the Corporate Legal department. 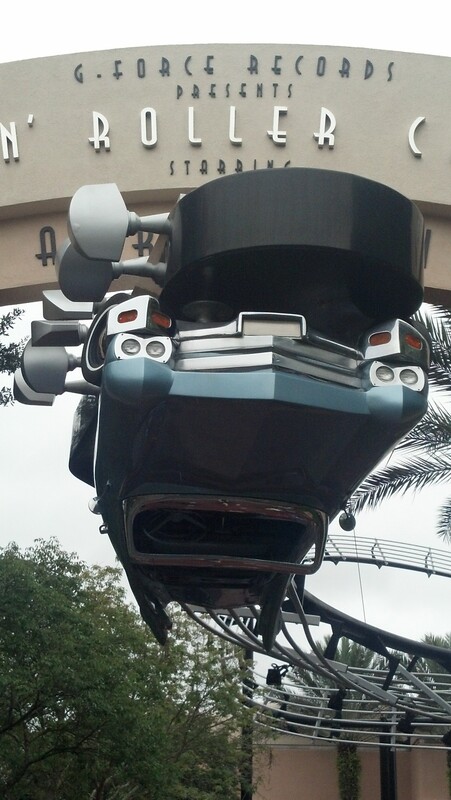 We take care of third-party clearance for the theme parks. 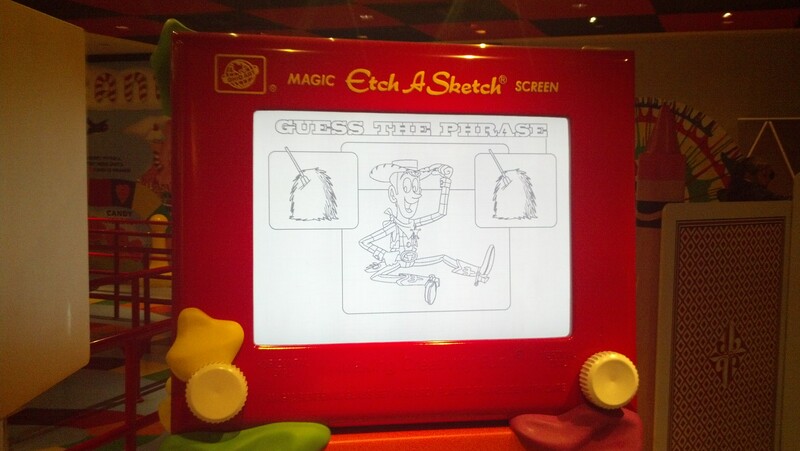 With Toy Story Midway Mania in Florida there was much more work to do. 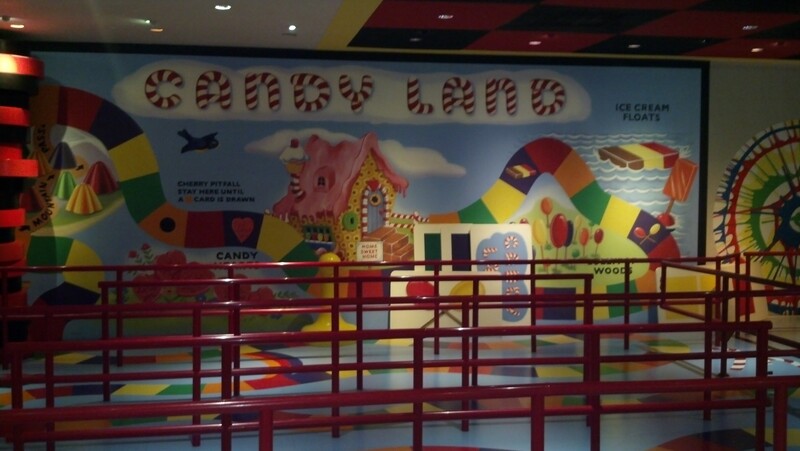 Disney does not own the intellectual property rights to “Candy Land.” So, we had to make an agreement with the company that does. The same is true of all the games in Andy’s room that make up the queue line. So, it was awesome for me to see the results of my group’s work first hand. 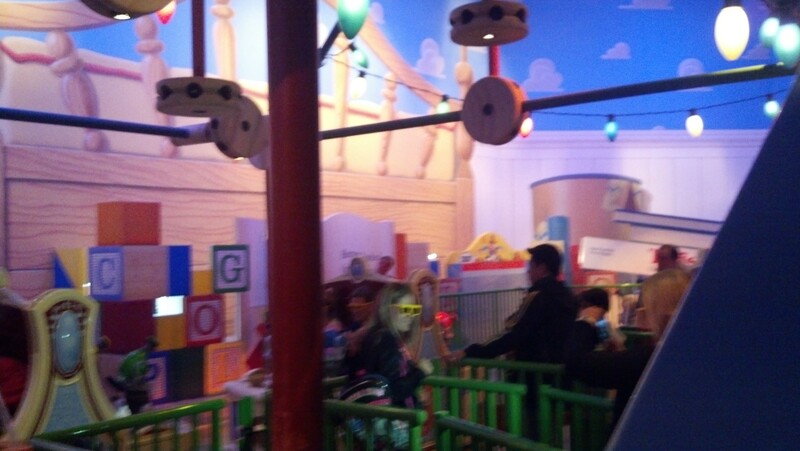 I absolutely love the queue line for Toy Story Midway Mania! The giant Etch A Sketch was super cool! Again, another thing my group had to work on an agreement to be able to use. 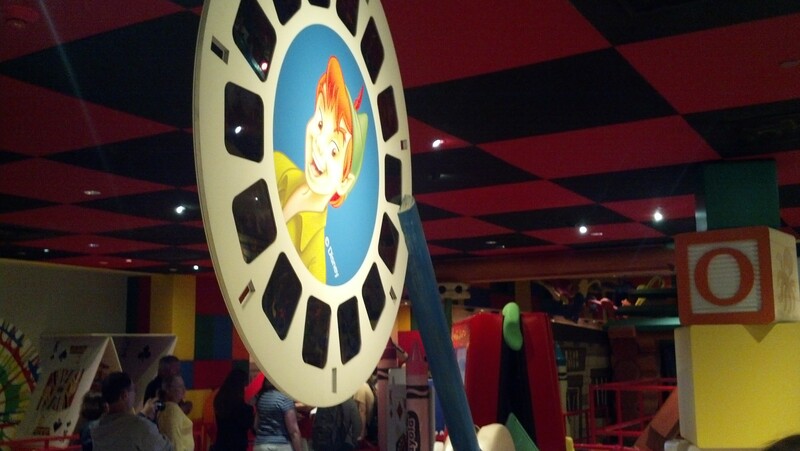 The Peter Pan viewmaster reel, we did not. Ah, my inspiration for the marathon costume! Cool picture! I wanted to capture everything in this line. It got to the point where I was feeling bad for those behind me. If I remember correctly, my wife just began telling others it was okay to move around us. Since I don’t know when I’ll be able to come back to Walt Disney World, I wanted to capture every part of the experience. Something familiar! Once you get going on the ride, it’s very similar to the Disney’s California Adventure (DCA) counterpart. This sign is exactly the same at DCA. I got a slightly lower score than I did when I visite DCA on December 23rd. 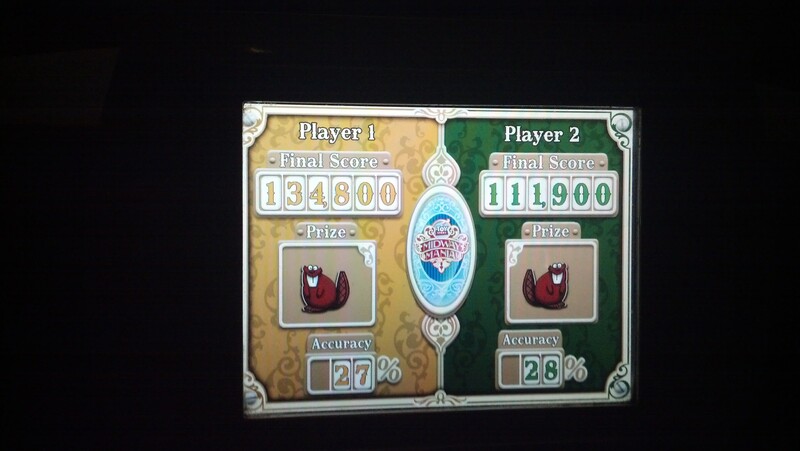 However, I still beat my wife’s score! 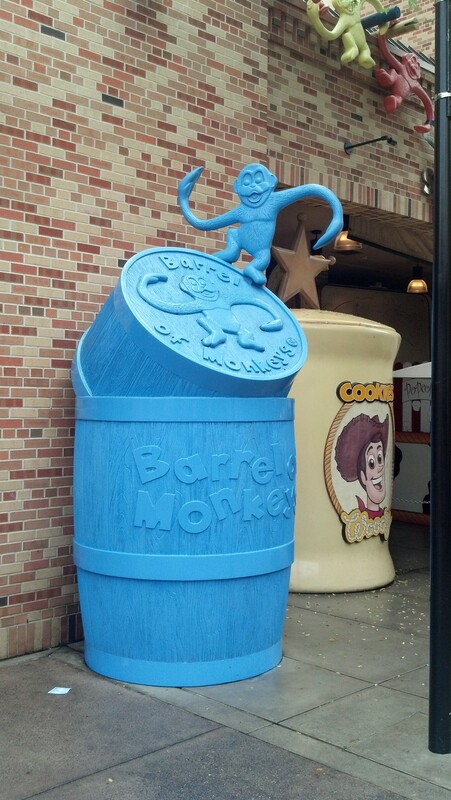 This attraction is very similar to the DCA Toy Story Mania once you get on the ride vehicle. Brooke and I love this attraction at DCA. So, it’s not surprising that we had fun on the DHS version. 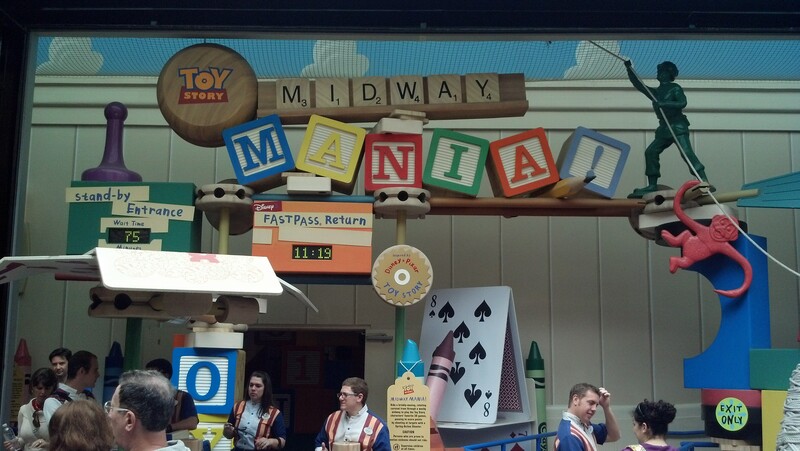 It is nice that they have fast passes for Toy Story Midway Mania at DHS. They need to do that at DCA where a typical wait time is at least 45 minutes. 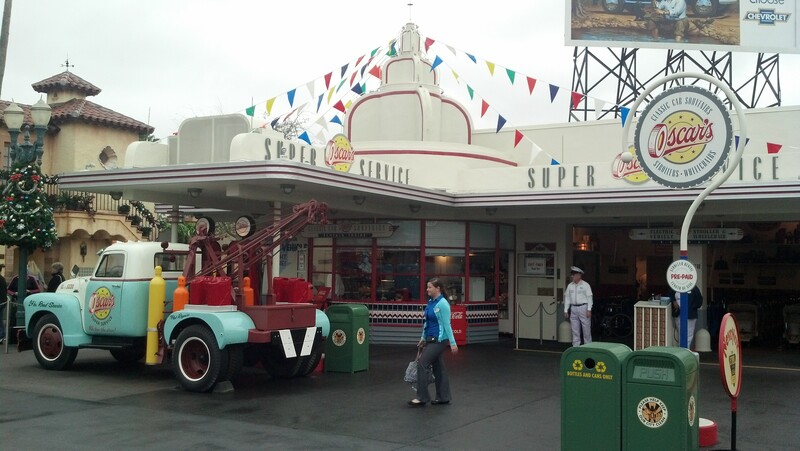 We had some time afterwards to wander around before our lunch reservation at the 50’s Prime Time Cafe. When we were on our honeymoon, we took in the Great Movie Ride. There wasn’t enough time to do so before lunch. 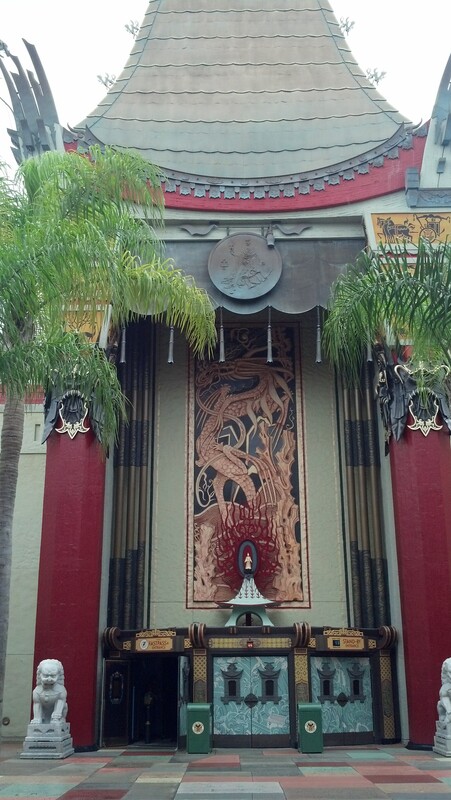 However, I really loved the detail of the Chinese Theatre replica they built at DHS! Minnie Mouse’s as well! If you’ve ever visited Hollywood, the Chinese Theatre is one of the big tourist spots. There are lots of people walking around checking out a similar scene. The only difference, of course, are there are famous actors represented in Hollywood. 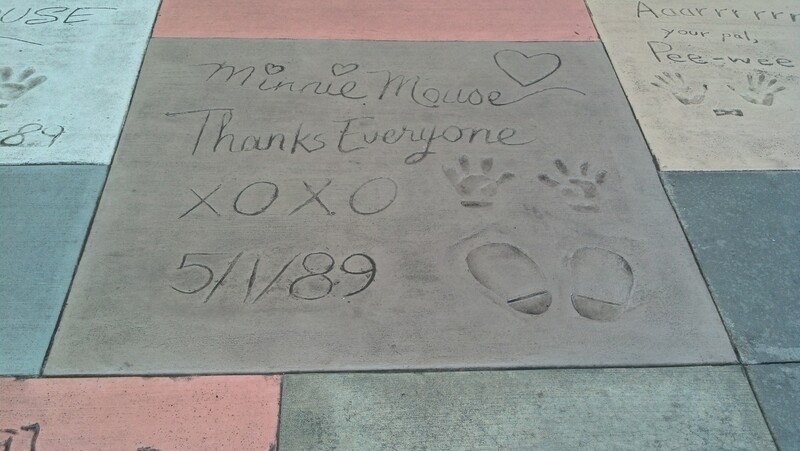 In front of the Great Movie Ride, most of the handprints are of Disney Characters. The best part of this, however, is that there are no creepy walk around people dressed up as movie characters like in Hollywood and there are fewer people. 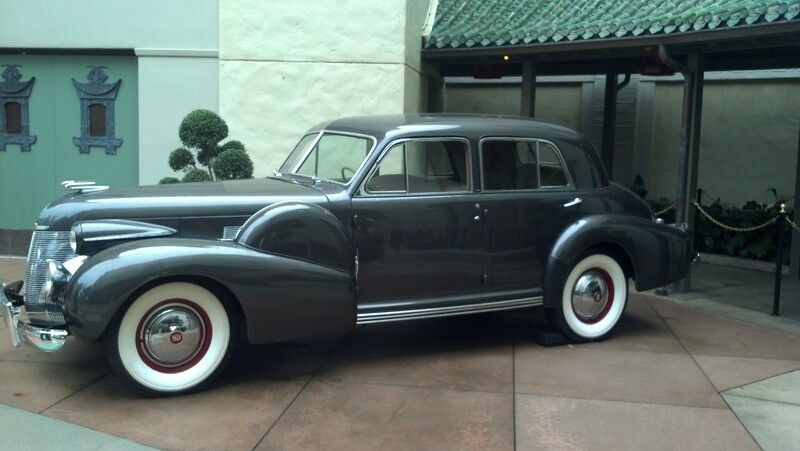 The car just sets the era of the early days of the Chinese Theatre. Hmmm. 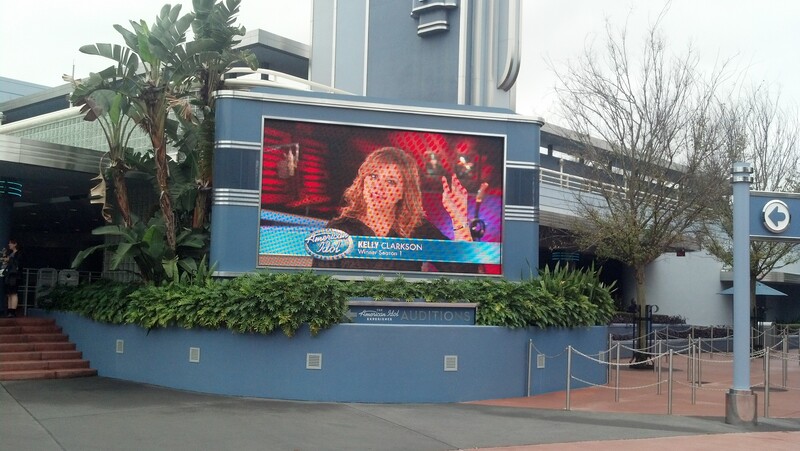 Maybe I should audition? However, we had lunch reservations. Brooke and I saw the “grand finale” show of the American Idol Experience when we were on our honeymoon. 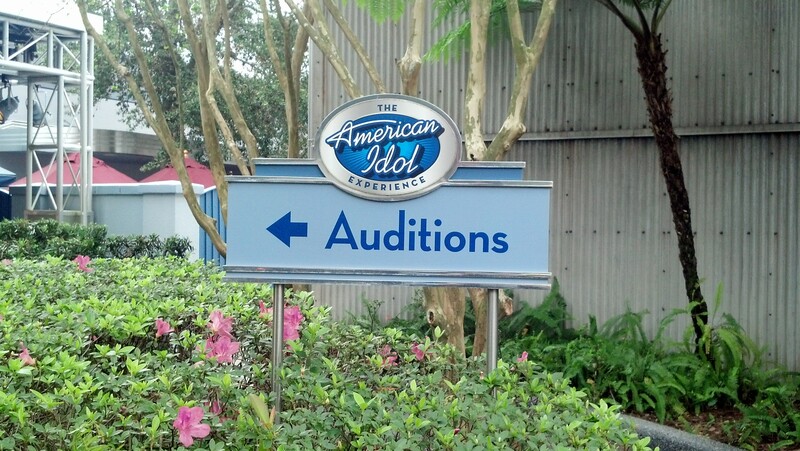 If you’re a fan of American Idol, like we are, this is a must see attraction. They do a really great job of recreating the studio where American Idol is taped. 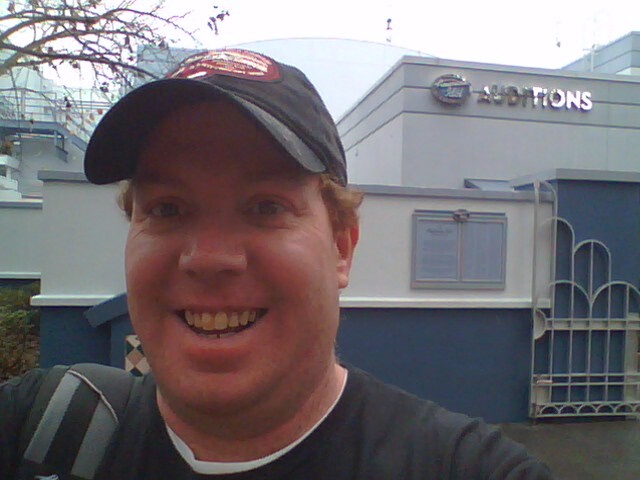 I got to see a taping of American Idol in season 2. As a matter of fact, I was at the show where Reuben Studdard was nicknamed “America’s Teddy Bear” by Gladys Knight. So, I know what the studio looks like. 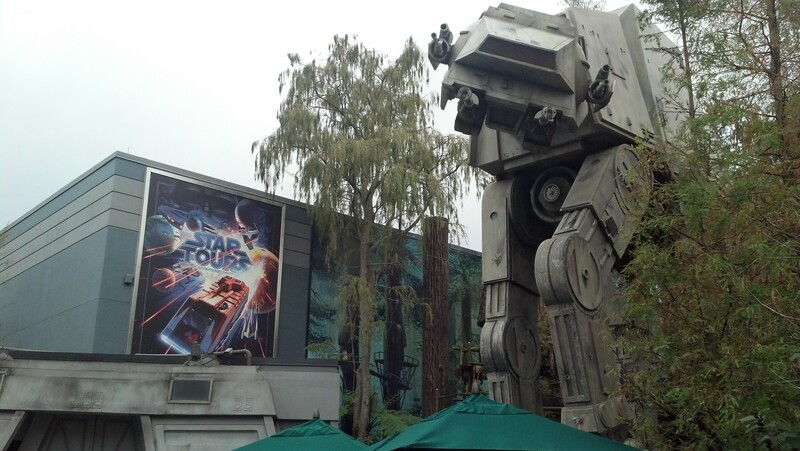 The Star Tours queue is also way more awesome than the one at Disneyland. I love the At-At! 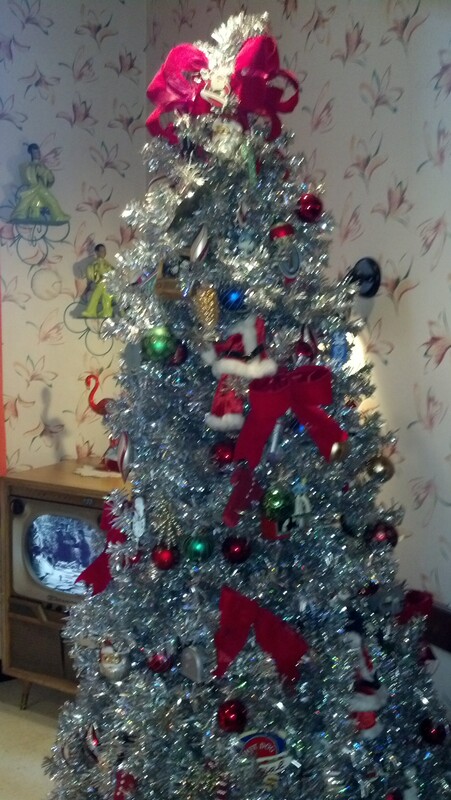 The 50’s Prime Time Cafe was also still decked out for the holidays! Christmas in the 1950’s! 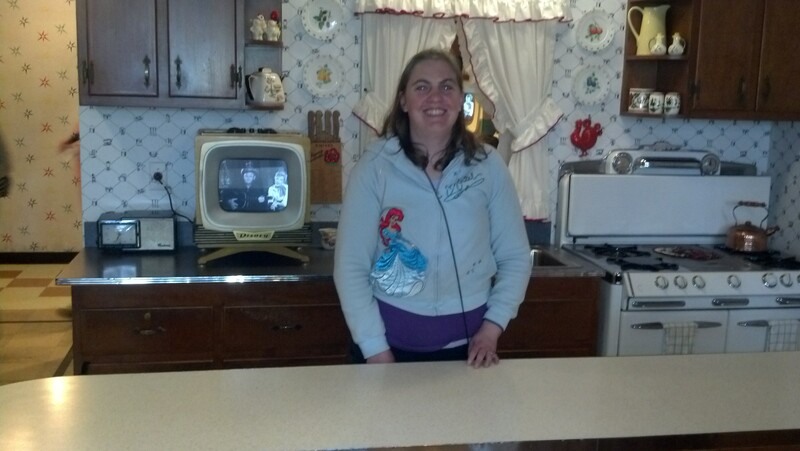 The 50’s Prime Time Cafe is themed around a dining experience at a home in the 1950’s. There are several rooms that are decorated as if you stepped right into the 1950’s. It’s such a fun place to eat! The booth you sit in comes complete with a 50’s style television that plays a loop of clips from 1950’s television shows. My favorite was the clips from the original Mickey Mouse Club! Brooke and I shared a sample platter. We did so because we couldn’t decide on what to order. 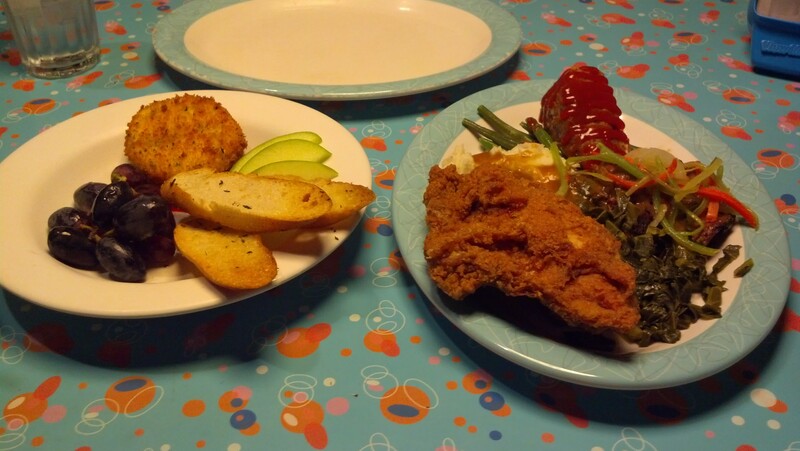 So, the sample platter came with smaller portions of what was on the menu. 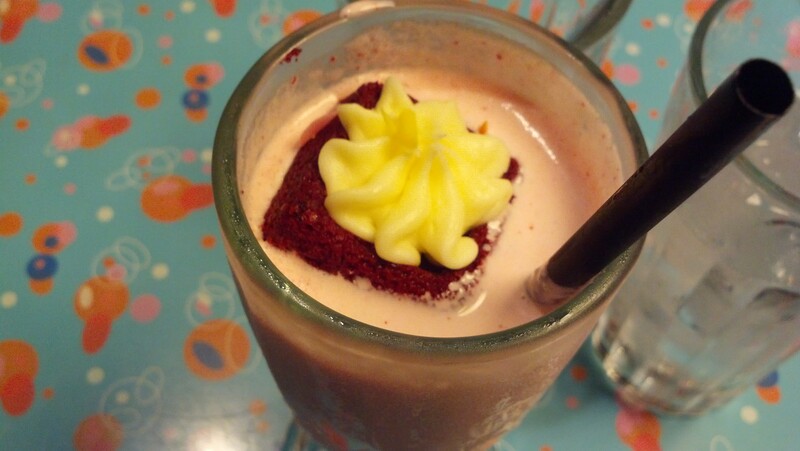 Since were in a 50’s theme restaurant, I got one of their specialty shakes…the Red Velvet shake. I absolutely LOVED it! So, on the menu, desert is missing. 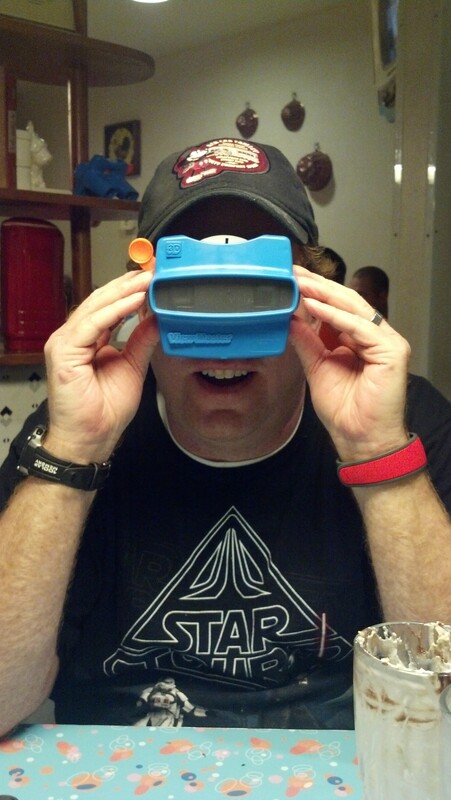 They have their desert menu on these viewmaster reels. The reel shows a picture of what the desert item looks like. Then, where the slide number would be, is the name of the item. It’s a pretty inventive way for having a menu! Since we shared the entrée, we were able to get desert. We got the Boston Creme Parfait and it did not disappoint. 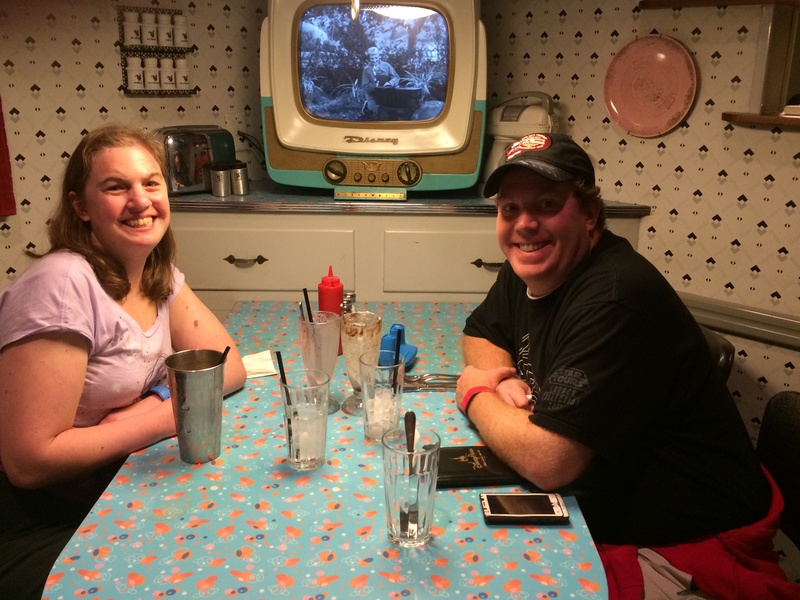 Overall, I would say that the 50’s Prime Time Cafe was an awesome dining experience! The waiter we had was hilarious! If you’ve never been, you should know that the wait staff will come and sit by you for some chit-chat in addition to taking your order. The guy who was our waiter was the waiter for our little room (4 tables). Not only was he entertaining with us, but everyone else as well. 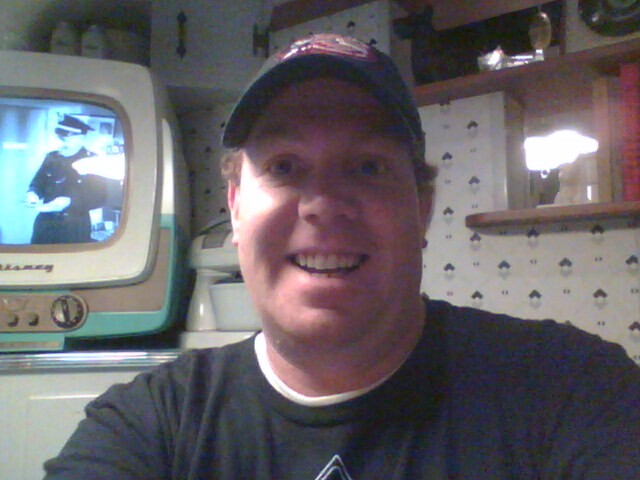 The theming of this restaurant is great! 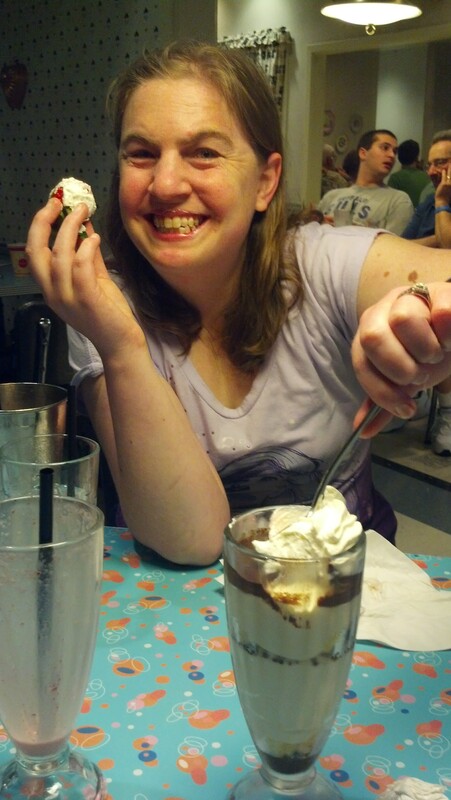 I loved the desert and the shake! However, the rest of the food was average. So, if you’re wanting a meal with the best food ever, the 50’s Prime Time Cafe is probably not for you. However, if you want a truly unique dining experience with food that is still pretty good, make your reservations for the 50’s Prime Time Cafe. Brooke and I would totally go there again. After lunch, Brooke and I decided to just wander around the park for a little before heading back to our resort for a nap before heading off to EPCOT. 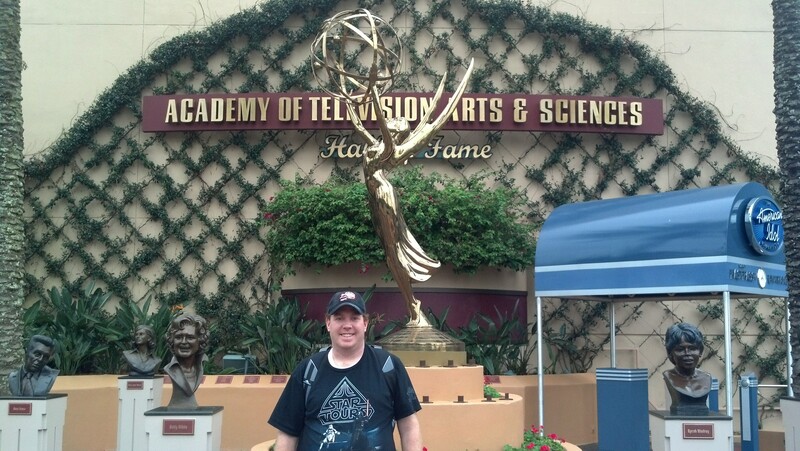 The Academy of Television Arts and Sciences garden is another place where my group has work for us. 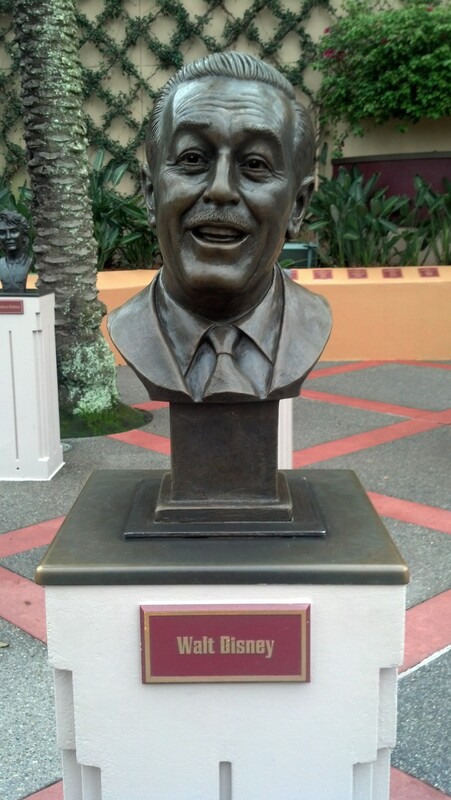 The busts in the garden will change from time to time. Although, I’m pretty sure this guy is always here. 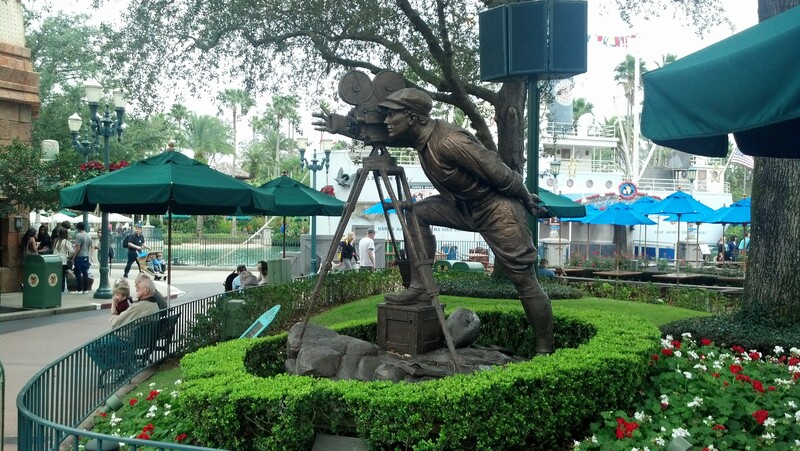 This statue reminds me of the statue at the entrance of Universal Studios Hollywood. 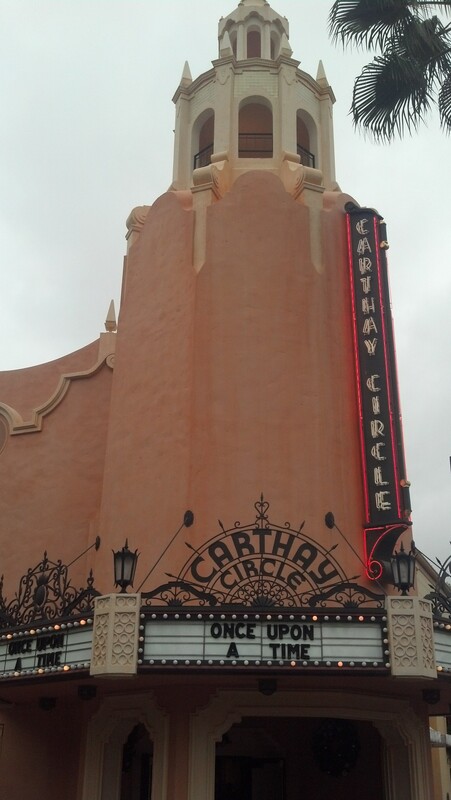 The Carthay Circle Theatre in DHS is a retail location. At DCA its upscale dining. The building at DCA is much closer to what the actual Carthay Circle Theatre looked like when Snow White and the Seven Dwarfs premiered. DHS has the original and best version of the Hollywood Tower of Terror. 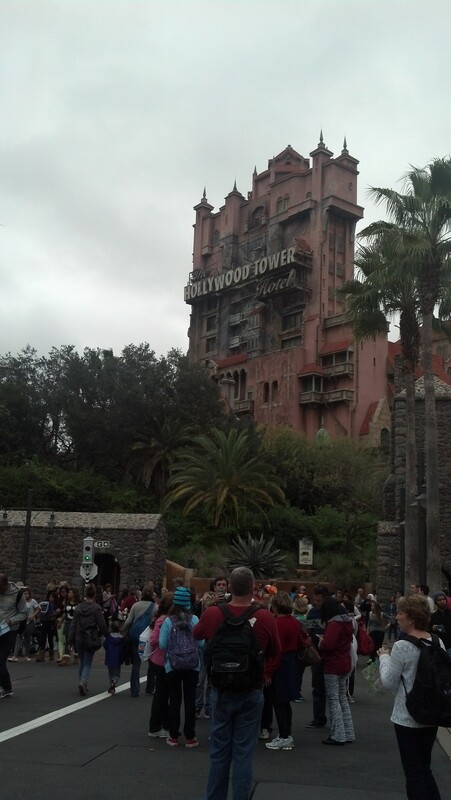 From what I’ve been told, the design of the Hollywood Tower of Terror in DHS is hard to replicate. 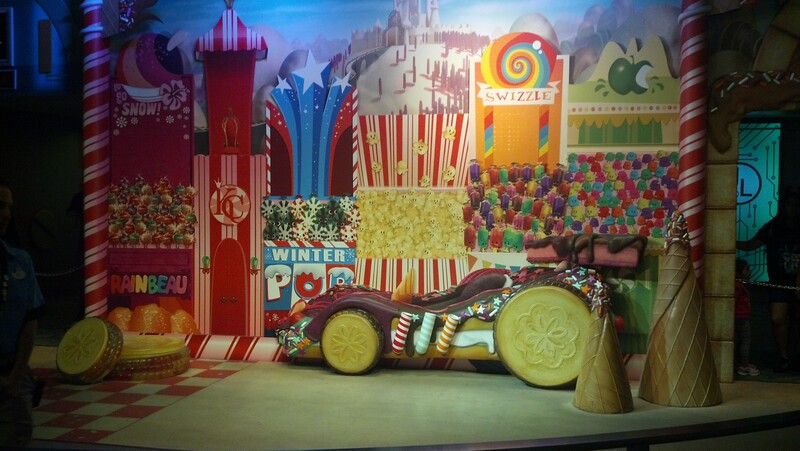 So, the DCA version of this attraction is the one that gets replicated at the overseas theme parks. 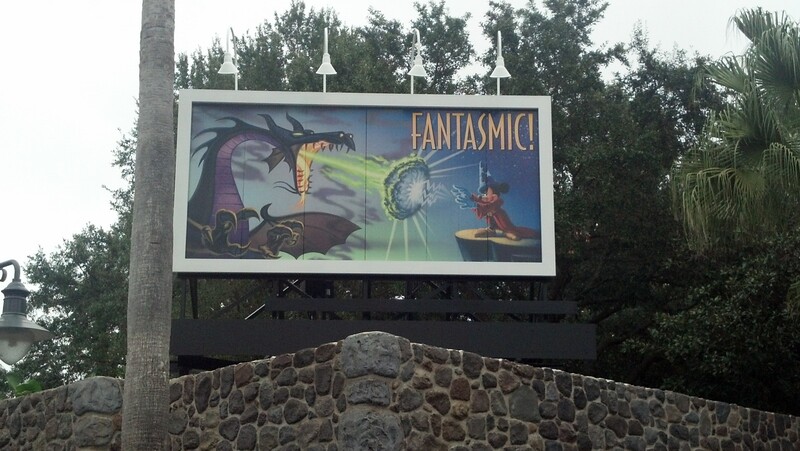 If we weren’t running the following day, I would have been tempted to take in Fantasmic at DHS. Even though I’ve seen it and like the Disneyland version better, it would have been something Brooke might have enjoyed. 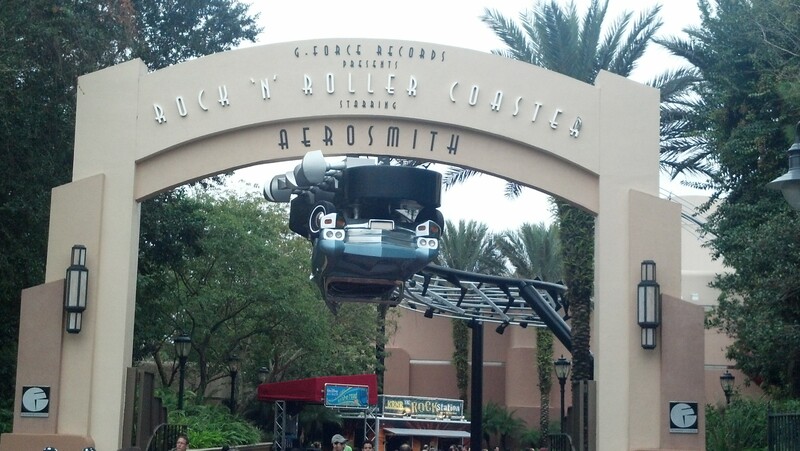 I love the entrance to Rock ‘N’ Roller Coaster! 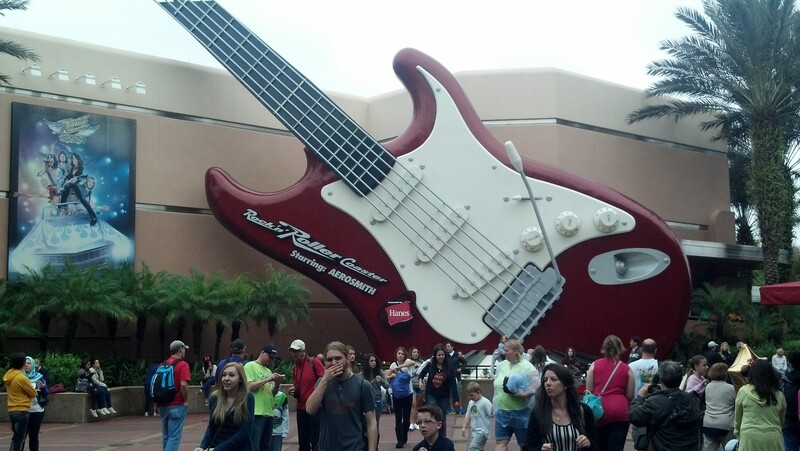 So, it’s a giant guitar. The neck of the guitar wraps around like a roller coaster track with the roller coaster car at the end. Very clever Disney! Then, it was time to head back to the exit of the park and make our way back to Disney’s All Star Sports Resort for a quick nap before heading to EPCOT. While some may bemoan the fact that DHS doesn’t have many ride attractions, it is a neat theme park to walk around and take in the sights. This theme park does have some good shows in it. If we were able to be here at night, Fantasmic would have been worth attempting to get into and watch. On our honeymoon, we loved the American Idol Experience (of course, Brooke and I are fans of American Idol). The Beauty and the Beast show was fun to watch. Also, I really liked the Indiana Jones Stunt Show when I visited here the first time. 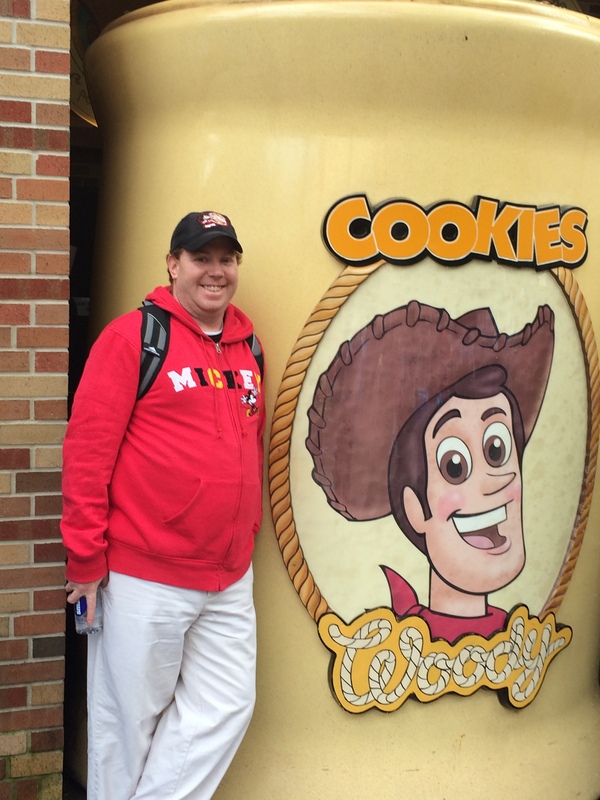 As I roamed the theme parks in Florida, everything felt familiar yet different at the same time. DHS has some elements that remind me of DCA, but is also very different. 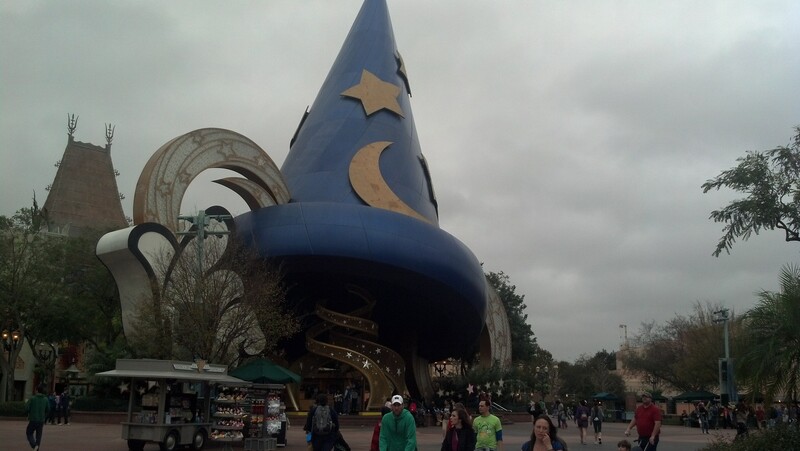 Our marathon trip marked my third trip to Walt Disney World and my third visit to DHS. I may not enjoy this theme park as much as Disneyland, DCA, the Magic Kingdom or EPCOT. However, if time permits, I will choose to visit this theme park every time I come back.